Josephine “Soupy” Piscopo of Mariners Harbor passed away on Tuesday Feb. 14, 2017 at the Staten Island Care Center. 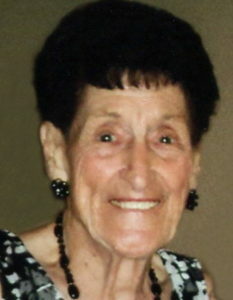 Born Josephine Capoferri she resided in Mariners Harbor and was a school aide of the NYC Dept. of Education at P.S. 44. Josephine loved the times she spent at the C.Y.O. Center and spending time with her family and friends. Josephine’s husband Angelo Piscopo died in 2015. She is survived by her loving daughter Patricia and her husband James Guarino. Cherished grandmother of Melissa and Michael Wright and Andrea Guarino. Adorded great grandmother of Michael and Vincent Wright. Aunt Soupy was the best. A loving, caring wife, mother, grandma, great grandma, sister, aunt and friend to all! One of my best of many memories of her is when every week (I think it was Tuesday nights) she would come to visit my mother-in-law. She was an amazing lady! Hi This is Karen, Jim DAngelo’s old neighbor Randy’s mom. I am so so sorry for your loss Soupy was loved by many. May she rest in peace. As you know I live in Florida and am unable to attend Soupy’s services, however, I wanted you all know that you are all in my thoughts at this time. My deepest heartfelt condolences. I was a student at 44, and Ms. Sue was a very loving, compassionate lady whom was a part of my upcoming. She will forever be in our hearts. I’m sorry for your loss prayers go out to you and your family..xoxo soupie was family to me always called me “b&#%!” with a great big smile ❤ I will miss you and love u..now she calling everyone up there b&*%#es ???????? Rest In Peace Ms. Sue. I will always remember you from my days as a child at P.S. 44. My condolences to her family and friends. Rest in peace Mrs. Sue as we affectionately called her at P.S.44. My heartfelt condolences to your family and friends. You will be remembered always. It was a pleasure to know her during my adolescent years as Ms. Sue then later as I became a part of her extended family and knew her as “Soupy”. I grieve with you all…no matter if she had lived 100 more years it wouldn’t be long enough for all of us that love her. She was as real as they come…no filter & that’s the way I hope to be in my late years. A true heart of Gold…we all know that heaven just gained a natural comedian. She will truly be missed. My thoughts & prayers are with you all (Especially my twin Lulu).